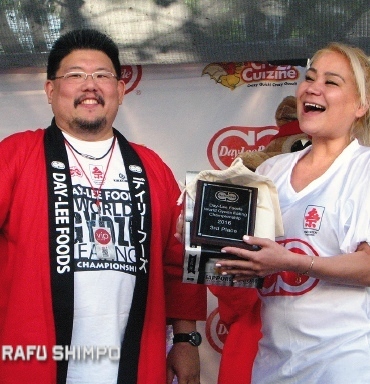 Stonie stuns a capacity crowd as he downs 323 gyoza to repeat as Nisei Week eating champion. 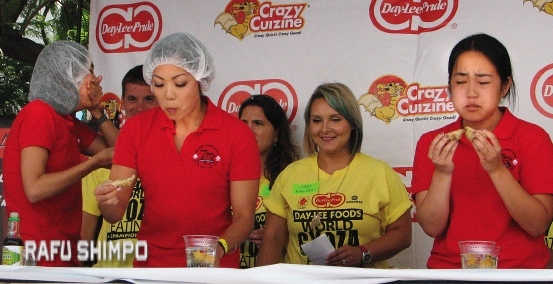 Miki Sudo, left, and Matt Stonie gobble down dumplings during the 2016 Day-Lee Foods World Gyoza Eating Championship on June 20 at the JACCC Plaza. The contest was minus the world’s marquee competitive eater, but that did little to lessen the gastric spectacle in Little Tokyo on June 20. Matt “Megatoad” Stonie fell short of his personal best from last year, but still won the 10th annual Day-Lee Foods World Gyoza Eating Championship at the JACCC Plaza, downing 323 potstickers in 10 minutes. In besting some of the top “gurgitators” in the sport, the Nikkei from San Jose received $1,600 and a trophy from Jason Uno of Day-Lee Foods and a Day-Lee Foods happi coat from 2016 Nisei Week Queen Jaclyn Tomita. The rest of the $5,000 purse was distributed to the other top 10 finishers. Last year, Stonie ate 377 gyoza, beating his chief rival, Joey “Jaws” Chestnut, by just four. 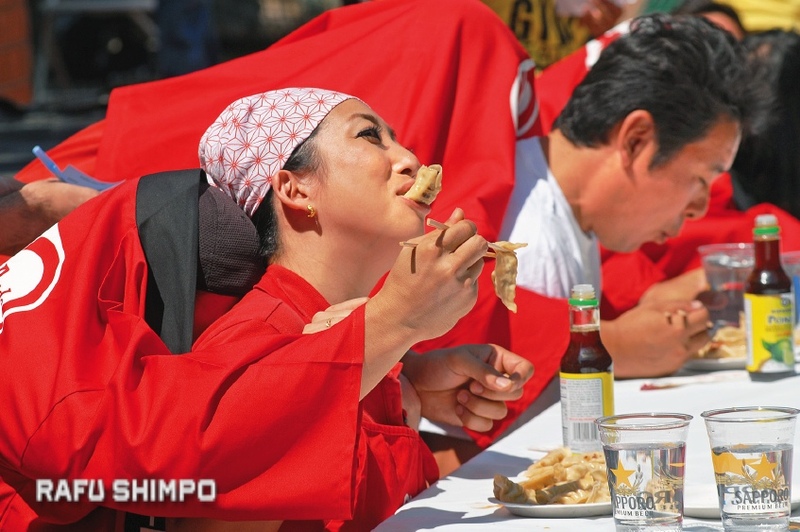 Chestnut, who did not compete this year, holds the world record for gyoza-eating — 384. Chestnut, also from San Jose, and Stonie are the No. 1 and No. 2 competitive eaters in the world, respectively. In this year’s Nathan’s Famous Fourth of July International Hot Dog Eating Contest, Chestnut took the title by downing 70 hot dogs, 17 more than Stonie. 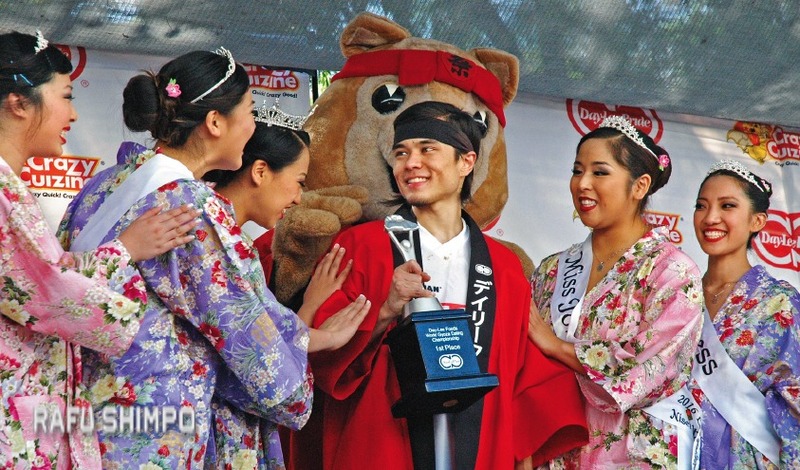 Matt Stonie repeated as champ and won $1,600, as well as the adulation of the Nisei Week Queen and Court. “I’m bummed he didn’t come. I love the rivalry,” Stonie said of Chestnut’s absence. Fourteen professional eaters participated in the gyoza event, which was part of this year’s Nisei Week Japanese Festival and was officially sanctioned by Major League Eating. Richard Shea, MLE co-founder and president, served as emcee. The competitors were cheered on by the Nisei Week Court, who helped serve plates of gyoza, and Aki the Akita, Nisei Week’s mascot. This marked Stonie’s first MLE win since May. Geoffrey Esper of Boston, making his gyoza contest debut, was second with 243, and Miki Sudo of Las Vegas finished third, as she did last year, with 229 — an improvement from 178 last year. Sudo was the top female finisher in the Nathan’s Famous contest, where she scarfed down 38½ hot dogs. Sudo, 31, tied her personal best and remains the top-ranked female competitive eater in the world, but felt he wasn’t in top form this time. Sudo said her next competition will be a pumpkin pie-eating event in Elk Grove on Oct. 2. Esper and Sudo received plaques, and the top five finishers each received a case of Sapporo Beer. Rounding out the top 10 were Gideon “The Truth” Oji (183), “Juan More Bite” Rodriguez (181), Rich “The Locust” LeFevere (168), Pablo Martinez (127), Eric “Badlands” Booker (116), Carlene LeFevre (80), and Doug Ecks (72), followed by Mary Bowers (65), Kentaro Shimizu (63), Lesley Ryder (50), and Corey Young (30). 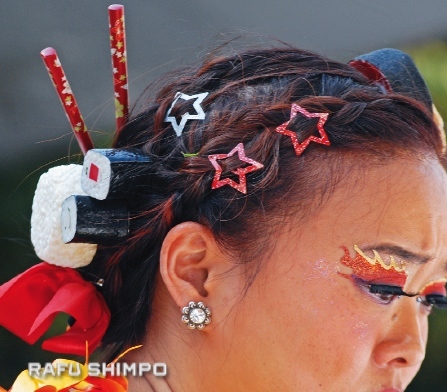 Mary Bowers had sushi on the mind for her contest attire. Bowers, decked out in her usual food-themed attire replete with sushi hair decor, said she was cruising along at first, but then hit a phagic snag. “The first plate went down nice and easy, really fast, but I felt some air in my stomach and that really threw me off,” Bowers reported. Booker provided pre-contest entertainment by rapping about his love of gyoza. Young also participated in the Rubik’s Cube competition in JACCC Plaza earlier that day. The LeFeveres were the only husband-and-wife competitors in the group. Ayako Shimizu struggles to get a grip on her lunch, as she is fed by ninin-baori partner Shuichi Yanagidaiwa. The main event was preceded by unofficial community contests. In a two-minute battle between the 2015 Nisei Week Court and representatives of other community groups, the winner was Christian Miyamae of the Japanese American Cultural and Community Center with 34, followed by Bradley Juris of LTRoots (32), First Princess Veronica Ota (17), Miss Tomodachi Karen Mizoguchi (14), Kevin Oyama of Little Tokyo Service Center (14), Queen Sara Hutter (13), 2015 Nisei Week Foundation President Terry Hara (12), Princess Tamara Teragawa (11) and Princess Camryn Sugita (5). 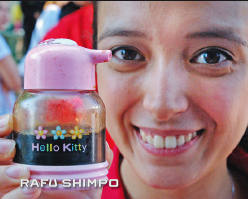 Veronica Ota brought her personal bottle of ponzu sauce for her turn in the competition. New this year was a ninin-baori competition in which participants worked in pairs, one person behind the other, wearing a single happi coat. The person in front ate gyoza with ponzu sauce and drank water, but the person in back, unable to see, provided the arms and had to put the food and drink in the first person’s mouth. Osaka Kenjin Kai (Keiiki Shinkai and Kazuyoshi Kinoshita) was the first to eat all 20 gyoza, Yamanashi Kenjin Kai (Ayako Shimizu and Shunichi Yanagidaiwa) second, and Gifu Kenjin Kai (Kazuyo Saeki and Mayumi Toida) third. In another team competition, five members each of the Los Angeles Police Department and Los Angeles Fire Department (including retired Deputy Chief David Yamahata) faced off. After 3½ minutes, LAFD won bragging rights, 170 to 145. 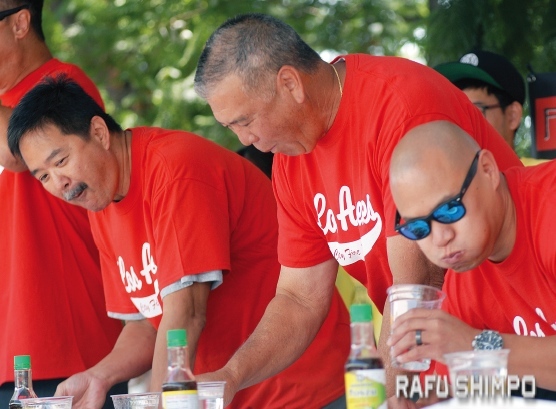 From left, Masa Matsuura, David Yamahata and David Tu compete for the L.A. Fire Department in their chow-off against the LAPD. The winners of the three amateur contests each received a case of Sapporo Beer. While catching her breath in a shady corner of the plaza, Sudo was embraced by a friend who quietly asked how she was feeling.